Fig. 3. Effect of TBBPA on the activity and expression of MMP-9 via NF-κB and AP-1 pathways in human breast cancer MCF-7 cells. (A) Mutations were introduced into the NF-κB- or AP-1-binding sites of pGL2-MMP-9WT. Cells were transfected with wild-type, Δ NF-κB, or Δ AP-1 of MMP-9-Luc, and then treated with TBBPA (1–10 μM) for 24 hr. Cells were then harvested and assayed for luciferase activity. (B, C) Cells were transfected with NF-κB or AP-1-Luc and then treated with TBBPA (1–10 μM) for 24 hr. Cells were harvested and assayed for luciferase activity. 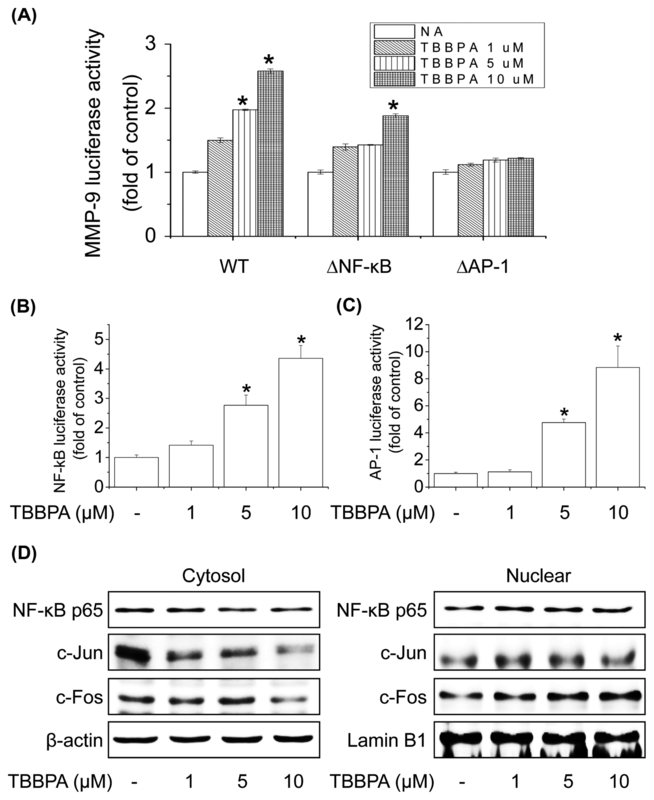 (D) Effects of TBBPA on NF-κB or AP-1 translocation. Cells were treated with TBBPA (1–10 μM) for 6 hr. Cytosolic or nuclear extracts were subjected to SDS-PAGE followed by Western blot analysis with anti-NF-κB, anti-c-Jun, anti-c-Fos, and anti-Lamin B antibodies. Each bar represents the mean ± SD calculated from three independent experiments. *Significantly different from the control at p < 0.01.